Many plants of the family Moraceae are used in the treatment of infectious diseases. Ficus polita Vahl., an edible plant belonging to this family is used traditionally in case of dyspepsia, infectious diseases, abdominal pains and diarrhea. The present work was designed to assess the antimicrobial activity of the methanol extract from the roots of F. polita (FPR), as well as that of its fractions (FPR1-5) and two of the eight isolated compounds, namely euphol-3-O-cinnamate (1) and (E)- 3,5,4'-trihydroxy-stilbene-3,5-O-β-D-diglucopyranoside (8). The liquid microdilution assay was used in the determination of the minimal inhibitory concentration (MIC) and the minimal microbicidal concentration (MMC), against seven bacterial and one fungal species. The results of the MIC determination showed that the crude extract, fractions FPR1, FPR2 and compound 8 were able to prevent the growth of the eight tested microorganisms. Other samples showed selective activity. The lowest MIC value of 64 μg/ml for the crude extract was recorded on 50% of the studied microbial species. The corresponding value for fractions of 32 μg/ml was obtained on Salmonella typhi, Escherichia coli and Candida albicans ATCC strains. The MIC values recorded with compound 8 on the resistant Pseudomonas aeruginosa PA01 strain was equal to that of chloramphenicol used as reference antibiotic. The obtained results highlighted the interesting antimicrobial potency of F. polita as well as that of compound 8, and provided scientific basis for the traditional use of this taxon in the treatment of microbial infections. According to the World Health Organization (WHO), infectious diseases is the first cause of death worldwide with more that 50% of the death appearing in tropical countries. In the developing countries, treatment of such diseases is complicated not only because of the occurrence of resistant microorganisms to the commonly used antibiotics, but also because of the low income of the population, which drastically reduce their accessibilities to appropriate drugs. It is reported that about 80% of the world population is dependent (wholly or partially) on plant-based drugs . Scientific experiments on the antimicrobial properties of plant components were first documented in the late 19th century . Naturally occurring antimicrobials can be derived from plants, animal tissues, or microorganisms . The shortcomings of the drugs available today propel the discovery of new pharmacotherapeutic agents in herbal medicine . Amongst the medicinal plants investigated in our research team, the family Moraceae is largely represented. Some of the plants of the genus Ficus, Morus, Treculia, Dorstenia , also belonging to this family, were previously reported for their antimicrobial activities [5–11]. In our continuous search on medicinal plants of the family Moraceae, we focused herein on Ficus polita Vahl. F. polita is an edible plant growing in lowland rainforest and gallery forest (West and Central Africa), coastal and dry forest (East and Southern Africa), up to an altitude of 1200 m. The edible fruits are chewed for dyspepsia, while leaves (also edible) or bark and roots infusions are used in the treatment of infectious diseases, abdominal pains and diarrhea [12, 13]. The phytochemical investigation of this taxon  revealed the presence of a cerebroside named politamide, sitosterol 3-O-β-D-glucopyranoside, betulinic acid, stigmasterol and lupeol. The methanol and dichloromethane extract from the stem exhibited anti-inflammatory activities . Water extract from this plant also showed anti-HIV activity through the inhibition of HIV-1 reverse transcriptase activity . Extracts from the leaves of F. polita also exhibited antimalarial action against Plasmodium falciparum cultured in vitro . The present work was therefore undertook to evaluate the antimicrobial activities of the extract, fractions and compounds from the roots of this plants, and to identify some of it's active components. The roots of Ficus polita Vahl., were collected in Yaounde, Center region of Cameroon in May 2007. The plant was identified at the National Herbarium (Yaounde, Cameroon) where a voucher specimen was deposited under the reference number 39955/HNC. The air-dried and powdered root (3.1 kg) was soaked in 10 L of methanol for 48 h, at room temperature. The methanol extract was concentrated under reduced pressure to give 216 g of a brown residue that constituted the crude extract (FPR). Part of FPR (200 g) was submitted to silica gel 60 (0.04-0.063 mm, 200 g) vacuum flash chromatography using as eluent, hexane (Hex), hexane-ethyl acetate (Hex-EtOAc) mixture of increasing polarity, and methanol (MeOH). This was conducted in accordance to the previously reported procedure . Five fractions were obtained, FPR1 (from Hex, 23 g), FPR2 (Hex-EtOAc 75%; 18 g), FPR3 (Hex-EtOAc 50%, 14 g), FPR4 (EtOAc, 12 g) and FPR5 (MeOH, 19 g). A part from FPR3, other fractions, upon antimicrobial assay were subjected to further purification. FPR1 (20 g) was column chromatographed using silica gel 60 (65 g) and Hex-EtOAc gradient as eluent. One hundred and forty seven (147) fractions of 50 ml each were collected. Sub-fractions 2-7 obtained with Hex-EtOAc 2.5% and combined on the basis of TLC analysis afforded compound 1 . Sub-fraction 34-40 (Hex-EtOAc 10%) yielded compound 2 . Sub-fractions 51-57 (Hex-EtOAc 15%) yielded compound 3 , while sub-fractions 76-81 obtained in Hex-EtOAc 22.5% gave compound 4 . FPR2 was subjected to column chromatography (CC) similarly to FPR1 and 76 fractions of 50 ml each were collected. Sub-fractions 26-33 eluted with Hex-EtEtOAc 15% yielded compound 5  while sub-fractions 38-41 eluted with Hex-EtEtOAc 20% afforded compound 6 . FPR4 was subjected to CC similarly to FPR1 and 2 using CH2Cl2-MeOH gradient as eluent and 107 sub-fractions were collected. Sub-fractions obtained in CH2Cl2-MeOH 5% afforded compound 7 . FPR5 was also subjected to CC similarly to FPR4 and 93 sub-fractions were collected. Sub-fractions obtained in CH2Cl2-MeOH 10% afforded compound 8 . 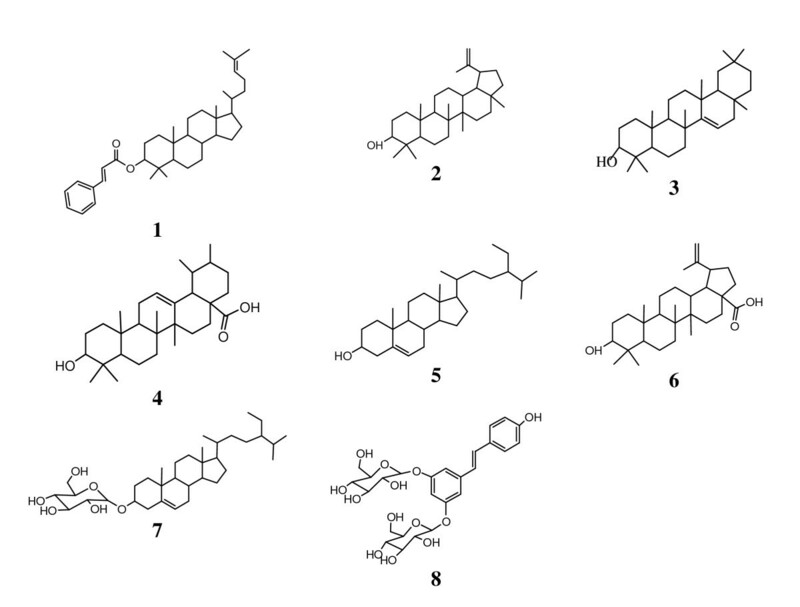 The chemical structures of the isolated compounds are illustrated in Figure 1. Chemical structures of compounds isolated from the roots of Ficus polita. 1: euphol-3-O-cinnamate; 2: lupeol; 3: taraxar-14-ene; 4: ursolic acid; 5: ß-sitosterol, 6: betulinic acid; 7: sitosterol-3-O-ß-D-glucopyranoside; 8: (E)- 3,5,4'-trihydroxy-stilbene-3,5-O-β-D-diglucopyranoside. Aluminum sheet pre-coated with silica gel 60 F 254 nm (Merck) was used for thin layer chromatography; The spots were visualized using both ultraviolet light (254 and 366 nm) and 50% H2SO4 spray reagent. NMR spectra were recorded on a Bruker Avance 300 at 300 MHz (1H) and 75 MHz and Bruker Avance 600 at 600 MHz (1H) and 150 MHz (13C), with the residual solvent peaks as internal references. The melting point (m.p.) were determined using a Kofler microhot stage apparatus. Mass spectra were recorded with API QSTAR pulsar mass spectrometer. The structures of the compounds were confirmed by comparing with reference data from available literature. The studied microorganisms included reference strains of Providencia smartii (ATCC29916), Pseudomonas aeruginosa (PA01), Klebsiella pneumoniae (ATCC11296), Staphylococcus aureus (ATCC25922), Salmonella typhi (ATCC6539), Escherichia coli (ATCC8739 and AG100), Candida albicans (ATCC 9002) obtained from the American Type Culture Collection. They were maintained on agar slant at 4˚C and sub-cultured on a fresh appropriate agar plates 24 h prior to any antimicrobial test. Nutrient Agar and Sabouraud Glucose Agar were used for the activation of bacteria and fungi respectively. The Mueller Hinton Broth (MHB) was used for the MIC and MMC determinations. The Mueller Hinton Agar (MHA) was also used for the determination of the MMC on these species. Chloramphenicol (Sigma-Aldrich, St. Quentin Fallavier, France) and Nystatin (Sigma-Aldrich) were used as reference antibiotics (RA) respectively against bacteria and Candida albicans. p-Iodonitrotetrazolium chloride (INT, Sigma-Aldrich) was used as microbial growth indicator. The MIC determinations on bacteria and C. albicans were conducted using rapid XTT colorimetric assay according to described methods [24, 25] with some modifications. Briefly, the test sample was first of all dissolved in 10% (v/v) DMSO/MHB to give a final concentration of 512 μg/ml and serially diluted twofold to obtain the concentration ranges (4-512 μg/ml for the crude extract, fractions and isolated compounds, and 1-128 μg/ml for chloramphenicol and nystatin used as RA). 100 μl of each concentration was added in a well (96-well microplate) containing 95 μl of MHB and 5 μl of inoculum (standardized at 1.5×106 CFU/ml by adjusting the optical density to 0.1 at 600 nm SHIMADZU UV-120-01 spectrophotometer) . The final concentration of DMSO in the well was less than 3% (preliminary analyses with 3% (v/v) DMSO do not alter the growth of the test organisms). The negative control well consisted of 195 μl of MHB and 5 μl of the standard inoculum . The plates were covered with a sterile plate sealer, then agitated to mix the contents of the wells using a plate shaker and incubated at 37°C for 24 h. The assay was repeated three times. The MIC of samples was detected following addition (40 μl) of 0.2 mg/ml p-iodonitrotetrazolium chloride and incubation at 37°C for 30 min [24, 25]. Viable microorganisms reduced the yellow dye to a pink colour. MIC was defined as the lowest sample concentration that prevented this change and exhibited complete inhibition of bacterial growth. For the determination of MMC, a portion of liquid (5 μl) from each well that showed no change in colour was plated on MHA and incubated at 37°C for 24 h. The lowest concentration that yielded no growth after this sub-culturing was taken as the MMC . The chemical structures of the isolated compounds were established using spectroscopic analysis, especially, NMR spectra in conjunction with 2D experiments, COSY, HMQC, HMBC, and direct comparison with published information and with authentic specimens obtained by our research group for some cases. The compounds isolated from the roots of F. polita (Figure 1) were identified as euphol-3-O-cinnamate C39H56O2 (1; 14 mg; Mw : 556; m.p. 110-111°C) , lupeol C30H50O (2; 44 mg; Mw : 426; m.p. 215-216°C) , taraxar-14-ene C30H50O1 (3; 13 mg; Mw: 426; m.p. 211-213°C) , ursolic acid C30H50O3 (4; 18 mg; Mw : 456; m.p. 284-285°C) , ß-sitosterol C29H50O (5; 220 mg; Mw : 414; m.p. 277-278°C) , betulinic acid C30H48O3(6; 16 mg; Mw : 456; m.p. 295-297°C) , sitosterol 3-O-ß-D-glucopyranoside C35H60O6 (7; 25 mg; Mw: 576; amorphous powder)  and (E)- 3,5,4'-trihydroxy-stilbene-3,5-O-β-D-diglucopyranoside C26H32O13 (8; 30 mg; Mw : 576; amorphous powder) . However, the isolation of compounds 2, 4, 6 and 7 from this plant was reported . Using previously described protocol  for the purification of F. polita, four additional known compounds (1, 3, 5 and 8) were isolated from the roots extract. The isolated compounds included non polar terpenoids as well as polar compounds such (E)- 3,5,4'-trihydroxy-stilbene-3,5-O-β-D-diglucopyranoside, justifying the use of methanol as a good extraction solvent of bioactive metabolites from medicinal plants. This extract, fractions as well as compounds 1 and 8 were tested for their antibacterial activities and against C. albicans. The results are reported in Tables 1 and 2. MIC (μg/ml) of the crude extract, fractions and compounds isolated from the roots of F. polita and reference antibiotics on the studied microbial species. MMC (μg/ml) of the crude extract, fractions and compounds isolated from the roots of F. polita and reference antibiotics on the studied microbial species. bThe tested microorganisms were Providencia smartii (P. smartii); Pseudomonas aeruginosa (P. aeruginosa); Klebsiella pneumoniae (K. pneumoniae); Staphylococcus aureus (S. aureus); Salmonella typhi (S. typhi); Escherichia coli (E. coli); Candida albicans (C. albicans). (-): not determined because MIC value was not detected up to 512 μg/ml; (nd): not determined; >512: value above 512 μg/ml. The MIC results summarized in Table 1, showed that the crude extract, fractions FPR1, FPR2 and compound 8 were able to prevent the growth of all the eight tested microorganisms. Other samples showed selective activity. The lowest MIC value of 64 μg/ml for the crude extract was recorded on four of eight (50%) studied microbial species. The corresponding value for fractions (32 μg/ml) was obtained on Salmonella typhi, Escherichia coli and Candida albicans ATCC strains. Such activity can be considered as important, when considering the threshold MIC value (100 μg/ml) for plant extracts with significant activity . Nonetheless, the corresponding cutoff point for compounds (10 μg/ml), is not acheived with the tested compounds. However compound 8 exhibited moderate activities , the MICs below 100 μg/ml being recorded on three of the eight microorganisms tested. Taking in account the fact that F. polita is and edible plant, its seems reasonable to consider a more flexible stringent criteria indicating that extracts with MIC values below 8 mg/ml  are considered to possess some antimicrobial activity and natural products with MIC values below 1 mg/ml are considered noteworthy [30, 31]. Therefore, the activity recorded therefore with the extract, some of the fractions and compounds 8 could be considered as important, highlighting the antimicrobial potency of F. polita. The MIC values recorded with compound 8 on the resistant P. aeruginosa PA01 was equal to that of chloramphenicol used as reference antibiotic, confirming this hypothesis. The results of Table 2 showed detectable MMC values for some of the studied samples on the tested microbial strains. When analysing carefully the MIC and MMC results for the crude extract, fractions FPR1 and 2, compounds 8, it can be noted that MMC/MIC ratios lower than 4 were obtained with most of the studied samples, suggesting that killing effects could be expected . To the best of our knowledge, the activity of this plant, compounds 1 and 8 on the microorganisms studied in the present work is being reported for the first time. Compounds with enough evidence of their antimicrobial microbial activities such lupeol , betulinic acid , ursolic acid , β-sitosterol, sitosterol-3-O-β-D-glucopyranoside [36, 37], were not tested again in the present work. However, compounds such as lupeol exhibited moderate inhibitory effect against E. coli and Mycobacterium smegmatis . Nonetheless, these terpenoid-like compounds mostly exhibited poor or moderate activities. Their presence as well as that of Euphol 3-O-cinnamate and (E)- 4'-hydroxystilbene-3,5-O-β- diglucopyranoside, and possible synergistic activities, can explain the good antimicrobial activity observed with the crude extract of F. polita and fractions. Finally, the overall activities of this plant might be due to the presence of several antimicrobial compounds with moderate activities. The results of this study provide informative data for the use of the crude extract from Ficus polita against bacterial microbial infections. VK and JK carried out the study and wrote the manuscript; LPS, BN and PA participate to structural elucidation of compounds. BTN supervised the work and the manuscript writting. All authors read and approved the final manuscript.